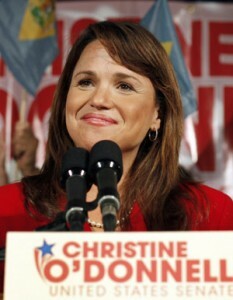 Truth Wins Out called on GOP Senate nominee Christine O’Donnell, last night’s victorious Tea Party candidate in Delaware, to apologize for running a failed “ex-gay” ministry while she headed the Savior’s Alliance for Lifting the Truth (SALT). O’Donnell heavily promoted the “ex-gay” industry and hired Wade Richards, an “ex-gay” poster-boy, to deliver this message . SALT staff member, Wade Richards, came out of the closet and renounced the “ex-gay” ministries in an August 14, 2000 Advocate magazine article. Richards made the decision to come out after he and Truth Wins Out founder Wayne Besen, who at the time worked for The Human Rights Campaign, debated on the Alan Colmes Radio Show. Richards was featured in the movie “Fish Can’t Fly”, which detailed the harm done by “ex-gay” organizations. O’Donnell defeated nine-term Representative Mike Castle, a mainstay in Delaware politics and a political moderate. O’Donnell also opposes masturbation. Truth Wins Out is a non-profit organization that fights anti-gay religious extremism. TWO monitors anti-LGBT organizations, documents their lies and exposes their leaders as charlatans. TWO specializes in turning information into action by organizing, advocating and fighting for LGBT equality. Our goal is to create a world where LGBT individuals can live openly, honestly and true to themselves.